Designing Spaces with Huge Impact! You want a truly fabulous garden don't you? Designing spaces with some of the garden trickery that follows can deliver some incredible results! 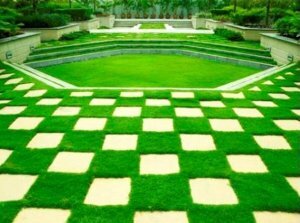 These garden design ideas are fun ways of making your garden deliver much more dramatic and interesting results. Most of us do not have the 5 acres plus of land it would take to fulfill our greatest dreams of design ecstasy! So how do we take our quarter acre garden plots and give them the importance they deserve? Or worse yet, how do we transform the alley in the back that is all that is left to us in our urban world in which to create a garden? Like any other 3 dimensional art form, gardens occupy space. Design in the garden is all about how to use that 3 dimensional space in a fashion that is visually stimulating. We’ve already discussed elsewhere how any view in 3 dimensional spaces is comprised of three spatial planes,the foreground, the middle ground and the background. These design tricks are imaginative ways of using this information to make a garden space appear larger or more electrifying. They help you to introduce the tension and visual impressions that will leave your visitors wondering at your astonishing design know-how. Ready? Here are some ways to shine when designing spaces for your garden! 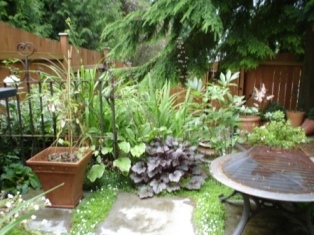 Smaller gardens often are difficult to know how to design effectively. One especially easy way to excel when designing spaces for your garden is to exaggerate. I know… Your mother told you not to exaggerate…. She was NOT talking about the garden though! Enlarging an element in the garden can deliver a sense of surprise or engender a sense of order. 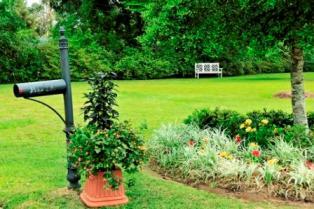 Large focal points in small gardens trick the eye into a sense of space. 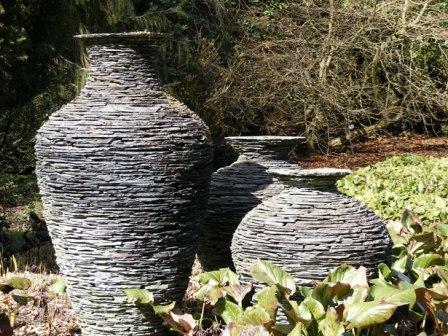 Garden elements that are unexpected create a sense of drama in any garden large or small. Designing spaces using enlarged elements is a sure way of creating a splash. Or an unusual flower display! This is a favorite trick of mine. It accomplishes so much with so little effort! 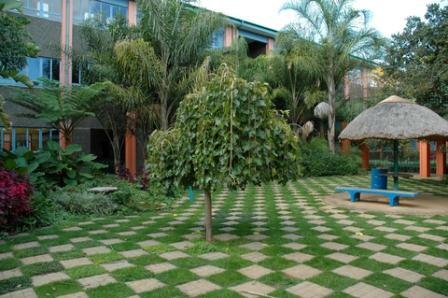 Overlapping elements in the garden creates an intimacy and sense of depth in your garden spaces. Designing spaces with overlapping elements goes a long ways toward expanding the sense of space in a garden. 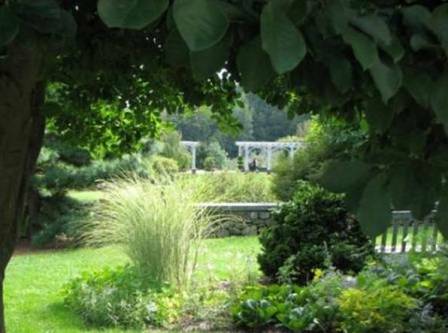 What does it mean to overlap garden elements? 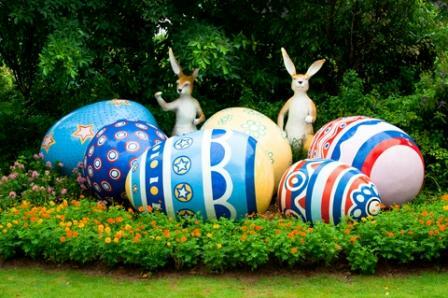 How about playing with your garden visitor’s minds!? Here is a technique that creates a lot of “wow” in the spaces you design. There are a couple of very effective ways to trick our eyes using vertical space. presented with an element that dominates their view, which suggests significance. Here is a great example! Located on a hill above an approaching walkway, this home becomes an automatic destination point, both because of its familiarity and its position at the pinnacle of the viewers’ vision. Do you think for a moment your visitor isn’t drawn to go investigate the grounds? There may be no hurry, but your visitor WILL visit the house as they wander the garden. On the other end of the spectrum, designing spaces to include changes in level can create a strong sense of design interest. We human beings tend to focus on areas that change level, and by including these changes, we can greatly enhance the impact of an area, whether large or small. In this stirring example of designing spaces with vertical appeal, the mostly green garden would have very little real impact without the changes in level. However, modifying the garden floor level and emphasizing alternating line directions, this garden has moved from mundane to magnificent! Want to spend more time in the garden? Design for bird’s eye viewing. You won’t be able to help yourself! Do not ignore the view from above when designing spaces. Many of our homes have more than one level, which provides real opportunity to create an incredible impact. This perspective offers new opportunities to create drama and interest. 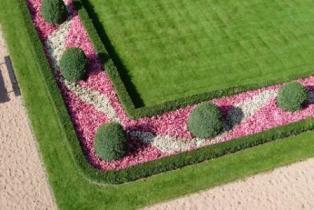 The effect of a garden designed for maximum impact from above is to draw a viewer into the garden. Its visual appeal and character extend an invitation that no spoken delivery can match. 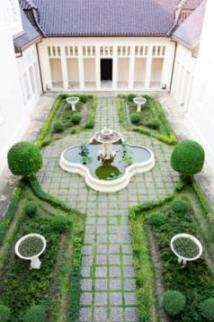 Likewise, in this courtyard garden, the view from above attracts. You to want to put your feet on the ground in this garden! The sense of order and elegance created by the use of expressive line and balance in this garden might be entirely unappreciated from ground level. By planning for the view from above, the designer has created a lasting and dramatic impression. This same garden, planted only for ground level impact, might appear quite uninteresting from above. The careful use of hardscape elements and points of interest in this garden elude that failure by providing points of interest from above. What a hip treatment this one is! Patterns are created using uniform plantings, pink and white crushed glass, and dramatic lines that create an interest that may be totally lost at ground level. 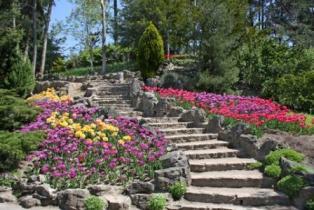 Yet from this perspective, this garden takes on a drama that is unique, inviting and nearly impossible to ignore. Something about the human mind revels in space. In a position of command and facing toward wide open spaces, we respond emotionally as though we are master of all we survey. The position of dominance, remaining above and facing these spaces, gives our spirits a rush. Be careful using this when designing spaces however, as it is easy to go awry with it. or above them. Our need to protect ourselves is deeply instinctual, in spite of our modern day thinking. To take advantage of this design trick, you will need to orient larger spaces in front of the garden visitor, and more often than not, in a “safe viewing stance”. Sitting with your back to the house wall, looking onto a large, open space, or on a protected patio, looking over the ocean, is a great experience and one we seek out. Sitting in the middle of a large lawn with nothing around is NOT a great experience. Likewise, sitting in an open space with ledges above and behind our heads is uncomfortable for most people. We avoid these situations due to our instinctual need to protect ourselves in nature. The opposite of wide open spaces is enclosure. Human beings love enclosure. It protects, it hides, it isolates, it envelops. These are safe environments for us. Therefore, as long as the sense of enclosure and the need for space in which to move are adequately balanced within our gardens, we embrace these enclosed spaces as favorite hangouts. We dismiss our instinctual fear of unprotected space and relax. What are your favorite hangouts? A hammock in the rear garden? A courtyard with wonderful old brick walls? A patio nestled near the master bedroom? All of these places in our gardens are enclosed spaces, even if they are hanging out in style. “Enclosure” may not mean that a space is isolated from view. It means only that we as human beings are safely tucked away when in it! Do you have a smaller garden? Maybe you have illusions of grandeur? Not to despair! The power of suggestion is there! Designing spaces that suggest that there is more than there actually is creates a powerful impact on any garden. Lifeless gardens get a new lease on life! To design spaces using this trick, use any element that disappears or suggests more to be seen! A path that curves out of sight, a door or arbor that suggests entrance, a stairway that descends to new depths or ascends to new heights. 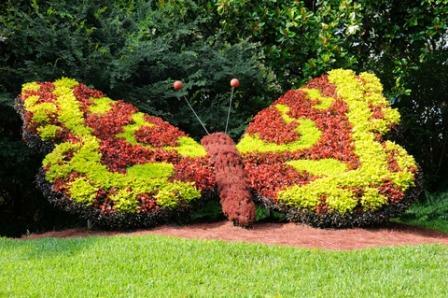 There are a thousand ways to play with your visitors mind and create the illusion of “more garden” just out of sight! This technique is especially useful in smaller gardens. Want to live in Italy instead of New York? Techniques such as using mirrors or trompe-l'œil can be extremely useful when designing your spaces. 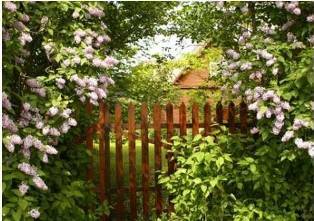 Both of these techniques can help to extend the garden, and create the illusion of more space, or of different places. The photo on the right is an example of this technique in action! 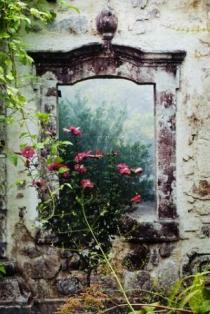 The “window” is actually a trompe-l’oeil painting of a garden. Change the picture, change the place! Instead of an English countryside, paint a Tuscany village. Instant Italy! Garden mirrors used shrewdly can also deliver great impact. Position a mirror at the end of a reflecting pool? Twice the impact! Hide the edges of a mirror under a frame of cascading flowers, set a mirror into a shadowed area to reflect more light, use a mirror on a horizontal surface to reflect the sky. These tricks all create a strongly visual impact that will add power to your garden pleasures. 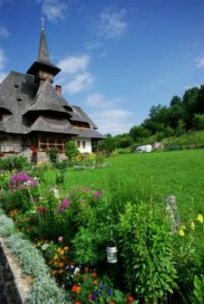 Think you can create that fabulous garden now? Designing spaces with any or all of the above ideas can enliven your garden, and create lasting impressions that may stay with your visitors for years after they visit. The results are guaranteed! Want to know more about designing spaces? Take a look at these hidden principles of spatial design!